Mexico’s regional newspapers, the source of news for many in the country, downplay the role of drug cartels in assassinations and other attacks on civil authorities. Many papers don’t even cover all the drug-linked executions in their localities. Mexico's regional newspapers are failing to report many of the murders, attacks on police and other violence linked to the nation's war against drug cartels, a new analysis shows. The Fundación MEPI, an independent investigative journalism center, studied the crime coverage of 11 regional newspapers and found that the drug-trafficking cartels receive little mention. The data, and interviews with journalists, shows that threats, bribery and pressure are shaping the news delivered to hundreds of thousands of Mexicans who live outside the capital, Mexico City. Regional journalists told MEPI they routinely do not report the role of the cartels in the mounting violence. They said that with the central government unable to protect prosecutors and police, they feel forced to chose between personal safety and professional ethics. 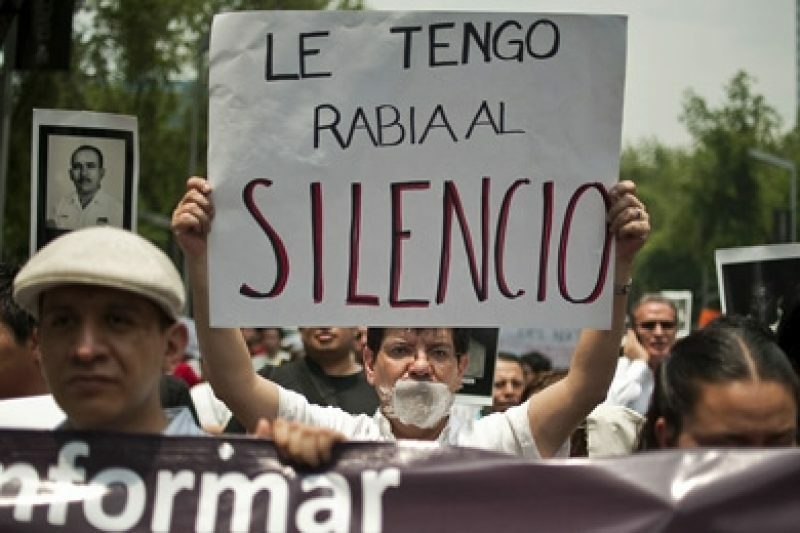 In recent years, the Mexican and international press have reported anecdotally on the intimidation of Mexican reporters. But MEPI's story provides the first quantitative picture of the problem. MEPI found that in almost every region, the number of stories each month that mentioned cartel violence amounted to a tiny fraction of the execution-style slayings tied to the cartels. 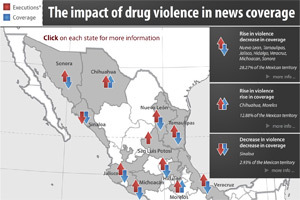 Click to see MEPI's map of the impact of drug violence in news coverage. In Ciudad Juárez, for example, cartel gunmen were reported to have killed an estimated 300 people each month in 2010. But in the first six months of this year, the newspaper El Norte, a reputable daily, mentioned the drug organizations in fewer than 30 stories monthly, according to the MEPI analysis. Alfredo Quijano, editor of El Norte agreed that his newspaper is very careful about how it addresses stories about violence. "Our stories are simpler today. We don´t do any follow up beyond one day." Dailies in eastern Mexico reported even less about the cartels. In the border town of Nuevo Laredo, just across the border from Texas the MEPI study found that the daily El Mañana published three stories referring to drug trafficking last June. That month, 98 people died in what appear to be cartel-related murders, according to the MEPI analysis. In total, the daily, published only 15 stories related to drug trafficking the first six months of 2010. Fourteen of those were about drug seizures on the U.S. side of the border in the city of Laredo. MEPI said it interviewed reporters and editors at regional newspapers to put the findings of the content analysis in context. All spoke on condition of anonymity, saying they feared retribution against themselves and their families. Several journalists were quoted as saying cartel members decide which stories can appear on front pages. In Tamaulipas, the drug bosses summon reporters to quarterly and monthly meetings to tell them what to cover, journalists told MEPI. In Veracruz, a daily that attempted to write tenaciously about drug issues had one of its reporters kidnapped as a warning and then released. The newspaper today reports little about drug violence, MEPI's analysis found. MEPI reviewed crime stories published during the first half of 2010 in the following newspapers: El Noroeste (Culiacán), El Norte (Ciudad Juárez), Norte (Monterrey), El Dictamen (Veracruz), Mural (Guadalajara), Pulso (San Luis Potosí), El Mañana (Nuevo Laredo), El Diario de Morelos (in Morelos), El Imparcial, (Hermosillo) and the newspaper Milenio's national and Hidalgo editions. The group counted stories in each publication that used Spanish words to describe drug war incidents: "narcotráfico," "comando armado," "cuerno de chivo" (literally, "horn of the goat," a popular nickname for AK-47 automatic rifles) and so on. The analysis found that newspapers have continued to fill their pages with stories on crime. But in paper after paper, gangland-style executions went uncovered while reporters filed stories on minor crimes not related to the drug conflict. For example, Matamoros and other regions of the northern state of Tamaulipas are at the center of the battle for control between the Gulf Cartel and their one-time enforcers, the Zetas. Killings are routine, but none of the incidents are described in the pages of local papers, MEPI said. MEPI recounted the story of a new church in the city of Pachuca, Hidalgo, about an hour's drive from Mexico City. The building was paid for by Heriberto Lazcano Lazcano, a local resident whose name was engraved on a metal plaque tucked away behind an interior wall. In Mexico, Lazcano is known "El Lazca." U.S. authorities have identified Lazcano as the leader of the Zetas, one-time enforcers for the so-called Gulf Cartel who are now a feared drug gang in their own right. Lazcano has been charged with drug trafficking in the United States and American authorities have offered $5 million for information leading to his arrest. Lazcano's gift to the church was widely known in Pachuca, Hidalgo, a traditional mining region, but it was not reported by the press until last month, when the Mexico City newspaper La Razón splashed the news on its front page, complete with pictures of the orange church and the plaque. A reason for the silence of the local press, MEPI said, might be found in what happened this year on Valentine's Day. A few weeks earlier, mysterious letters were delivered to local reporters in various smaller towns surrounding the capital of Pachuca. The letters invited reporters, free-lancers who typically earn $400 a month, to a party at the ranch Santa Inez, in Tepeji del Río, a local town. A reporter from the Valle del Mezquital who did not attend the party relayed an account he told MEPI he had heard from two colleagues. "Someone stopped the music and told those present everything was for them: the women, the alcohol, the gifts." The only condition: do not interfere with business. Soon after Valentine's Day, reporting on drug-related violence in Hidalgo plummeted, according to the MEPI story. Nobody ever wrote about the party or the message to reporters.